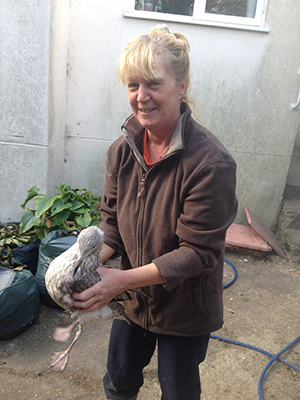 A Dorset woman is to receive a special award from the International Fund for Animal Welfare (IFAW) at the House of Lords, recognising many years of dedication to rescuing and rehabilitating injured or abandoned birds. Bird lover Lynne Parker, from Southbourne, has rescued hundreds of birds, both wild and domestic, over the last 21 years and is often called on by local vets, residents and rescue organisations to provide emergency treatment, food and accommodation. She single-handedly cleans and cares for the birds until they are ready for release back into the wild where possible, or transferred to a local rescue centre to make space for new emergency cases. She is creating a special ‘reproofing’ pool in her garden to ensure that birds affected by oil spills, or which have been traumatised, have regular access to water and do not lose the waterproofing on their feathers, which can occur when a bird is stressed. Lynne shares her home with up to 200 birds at any one time, and currently cares for finches, budgies, guillemots, starlings, blackbirds, pigeons, quails and a Canada goose. Occasionally she also provides refuge to other wildlife, such as hedgehogs and squirrels, and has a number of rescued dogs. She rescues around 4,000 birds a year, the vast majority of which are returned to the wild. Lynne will receive her award at IFAW’s prestigious Animal Action Awards event, hosted by Baroness Gale and presented by TV wildlife presenter Bill Oddie at the House of Lords on October 22.